(Onitsha Nigeria: 12th October 2017)-The greatest threat facing the Nigerian Army, its integrity and professionalism (if any) as well as its general acceptance and factorization into the multi ethno-religious Federation of Nigeria is its present lopsided composition; designed and executed by the present Buhari/Osinbajo Administration since 29th May 2015.The gross lopsided composition of the officers and personnel of the Nigerian Army is substantially, if not totally responsible for woes facing it since June 2015. The referenced terminal virus haunting the Army is also the case with other branches of the Nigerian Armed Forces and the Police. Apart from the official logo of the Nigerian Army written in Arabic/Islamic code, instead of the country’s adopted English Language (only), the recent purge leading to unceremonious and unholy retirement of dozens of senior military officers dominated by officers of non Muslim religions is clearly a further evidence of the gross ethno-religious lopsidedness under complaint. Also the case is the barefaced evidence in the presen northernization of the commanding positions of the Nigerian Army and other military formations in Southeast Nigeria or Igbo Land. Most of the Nigerian Army and the Nigerian Naval formations and their commanding positions in Southeast are presently manned by Muslim personnel and officers of northern Nigeria. (4) the immediate past, if not still the Commander of 144 Battalion (Sector) of the 14 Brigade (in Ohafia); located at Ukwa West, who is now at the 14 Brigade Headquarters is Lt Col Umar Sidi Kasim Muslim). (8) the Commander, Naval Outpost, Onitsha (Ogbaru) is Navy Captain Mohammed Dahiru (Muslim). This is just to name but few. It is therefore correct in its entirety to say that the mass killing by the Nigerian Army of unarmed and defenseless civilians of the Igbo Ethnic Nationality stock; forbidden locally, regionally and internationally both in war and non war situations, is solely rooted in the foregoing. It is on statistical, empirical and legal records that not less than 400 unarmed and defenseless citizens dominated by the active population of the Igbo Ethnic Nationality have been shot and killed by the Nigerian Army; between 30th of August 2015 and 14th of September 2017 or in the past two years. Not less than 450 others were shot and terminally injured. Apart from recorded deaths of not less than 270 unarmed civilians between 30th of August 2015 and 20th of January 2017, the death toll arising from the Nigerian Army genocidal operations of 12th and 14th September 2017 in Abia State may most likely have risen to not less than 100. From our findings so far, not less than 60 deaths have been recorded. These include six dead bodies of unarmed and defenseless civilians and residents of Aba saved and deposited in an Aba mortuary, four fully identified dead bodies/victims of the Army’s late night raid of 12th September 2017 in Aba, five fully identified citizens shot and killed between 11th and 14th September 2017 by soldiers in their various places of work in Aba, six corpses saved and deposited in an Isialangwa mortuary and four members of IPOB’s barehanded security wing (already buried). Others are several dead bodies of IPOB supporters recovered from bushes around the palace of Citizen Nnamdi Kanu’s father at Afara-ukwu, near Umuahia in Abia State. Four of the retrieved dead bodies were recorded and videoed. These recovered dead bodies were those hit by military bullets; forcing them to run inside the nearby bushes from where they later died of gunshot wounds. There are also not less than 24 dead bodies reported to have been made away by soldiers after they were shot and instantly killed in the vicinity of the palace of the royal father of Citizen Nnamdi Kanu in late evening of 14th September 2017. It is our conservative estimate that not less than 100 unarmed and defenseless members of the civilian population were killed in the two days of the Army’s genocidal operations in Abia State. The Nigerian Army had earlier in the late night of 12th September 2017 embarked on house to house raid, torture and killing of civilians in their sleep. The affected areas included Umuode and Ariaria areas of Aba. It is therefore the totality of the foregoing that gave rise to widespread public suspicion and panic to the effect that the lopsidedly composed Nigerian Army may have further designed infanticide by injection or ethnic cleansing by other means; leading to panicky shut down yesterday (11th October 2017) of mission, private and public nursery, primary and secondary schools in Southeast and its neighboring States. The quick reactions of the parents and guardians as well as the owners and authorities of the affected schools are commendably best to none in modern early warning signals and quick and preventive response strategies. This is more so when the scar and controversies trailing the source of recent monkey pox epidemic in some parts of the South-south zone are yet to be satisfactorily cleared by the authorities of the central Government of Nigeria. 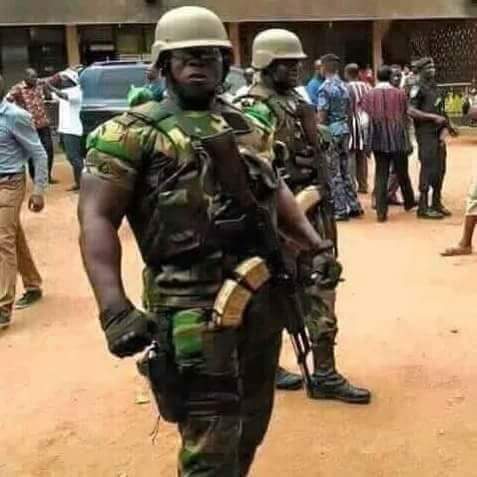 The reactions of parents and guardians; the authorities of the affected schools and general public of the Southeast and parts of the South-south are a red card to the Nigerian Military especially the Army. The reactions have further soured and deepened the Civil-Military frosty relations in Nigeria. The saddest part of it all is that some of these nursery and primary school pupils as well as secondary school children are those made fatherless, motherless or orphaned by the Nigerian Army since August 2015 during which their defenseless parents were massacred by the Army. We therefore make bold to say that the so called free medical services or outreach of the present lopsidedly composed Nigerian Army, their noisy and psychologically forceful methods of delivery have become a threat to public health in Nigeria. Till date, Nigerians are not aware of medical exploits of the Nigerian Army in the broad field of medicine tailored in regional or international standards. That is to say that the Nigerian Army is never known to have recorded regionally and internationally standardized breakthroughs in special or general medicines and other public health matters in the country. (1) what is the state of health in the Nigerian Army and its medical department? (2) Is it correct or incorrect to say that the Nigerian Army medical department has arrived regionally and internationally warranting its present noises about “Army’s free medical services”? During the ill-health of its C-in-C, what role did the Nigerian Army medical department play? How many qualified doctors of repute are in the Nigerian Army and its medical department? Nigerian Army recently shot and wounded over 400 Shiites and 450 Pro Biafra campaigners; within its Rules of Engagement, how many of these wounded citizens have been treated and healed medically? In its so called “free medical services” what areas of ailment are they treating or have treated? Was there feasibility study by the Nigerian Army showing that Southeast Zone and its population have low medical density or acutely lacked access to primary, secondary and tertiary healthcare; warranting the Army’s noisy and questionable “free medical services” in the Zone? How many WHO and NMA certified medical doctors are in the Army and attached to its present “free medical services”? Are the “free medical services” of the Nigerian Army certified, approved and supported by the World Health Organization, the Nigerian Medical Association and the Federal Ministry of Health? What have been the success or failure stories of the so called “free medical services” of the Nigerian Army? Has the Nigerian Army taken over the statutory functions of the Federal and State Ministries of Health? How can Nigerian Army mindlessly slaughter unarmed members of the civilian population and turn around to offer remnants of the same population “free medical services”? Is it morally or conscientiously right for a butcher to turn around and become a healer at the same time?